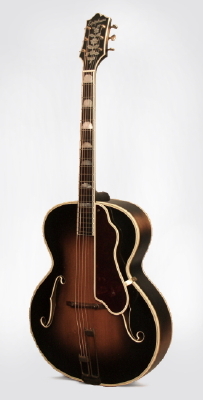 Epiphone DeLuxe Model Arch Top Acoustic Guitar (1938), made in New York City, sunburst lacquer finish, Maple back and sides, spruce top; laminated maple neck with ebony fingerboard, period tweed hard shell case. Original pre-WWII high-end Epiphone guitars are surprisingly hard to find today; this Deluxe model from 1938 is a rare treat for the archtop enthusiast and an extremely fine player's instrument. By the time this guitar was built, the Stathopoulo family had moved their guitar building operation back to Manhattan after ten years or so in Long Island City. Settled in on the second floor of a large loft building on 14th street, Epiphone, Inc. set up their factory/showroom in the heart of swing-era New York. The Deluxe was among the very finest orchestral guitars available, along with the inch-larger and even fancier Emperor, the Gibson L-5 and Super 400, and individually built creations from John D'Angelico (about 20 minutes walk downtown), Willy Wilkanowski (a subway ride out to Greenpoint, Brooklyn), and Elmer Stromberg ( a few hours north in Boston). The Epiphone company was headed by Epaminoudas ("Epi") Stathopoulo until his death in 1943. By all accounts he was an extremely fastidious and dedicated man who personally inspected every instrument produced. While all high-end carved-top Epiphone guitars are fine instruments, those produced during his lifetime seem to have a special magic about them. This Deluxe carries a serial number dating it to 1938, and is a great example of the more refined, 'perfected' swing-era Deluxe. The 5-piece laminated neck is slimmer than the older models, and feels amazingly modern. Original small openback Grover tuners equip the smaller headstock; the characteristic "E"-marked enclosed Epiphone tuner was not yet in production. The finish is a deep golden-brown sunburst highlighting the lovely flame maple back. The sound is both rich and powerful, with the definition Epiphones are known for. We rarely see these earlier top-line Epiphones, and are most pleased to offer this one for sale. Overall length is 42 in. (106.7 cm. ), 17 1/4 in. (43.8 cm.) wide at lower bout, and 3 7/16 in. (8.7 cm.) in depth, measured at side of rim. Scale length is 25 1/2 in. (648 mm.). Width of nut is 1 11/16 in. (43 mm.). This guitar has been restored to very fine playing condition with an extremely high level of skill. All body and neck bindings are re-done to the original spec, with the finish blended on the edges but no general overspray. The fingerboard is similarly re-bound and refretted; the headstock binding is original with no deterioration. Tuners and tailpiece are original; one nut is replaced on the frequensator. The back seam has been re-sealed and the back finish polished out; there is a very light clear overspray on the back of the neck. The bridge is the original full-footed rosewood with new thumbwheels and the saddle slightly compensated; pickguard is a reproduction in the correct bound tortoise celluloid. This is a fabulous-playing and sounding example of a very rare and fine New York-made guitar. Overall Excellent Condition.